Trade Goods Store - What's the best thing to buy? Bit of a subjective question, I know, but just curious - what do you think are the best things to spend Trade Goods on. I'm still fairly new to the game, about a week (level 18). I'm starting to acquire a good amount of Trade Goods and I've only been spending them on the hero tokens so far, but I can see Legendary gear, gear crates, class tokens, etc. So is there a general view that some items are better than others? Any advice for a newbie before I waste all these Trade Goods? I buy phones and class tokens to advance my survivors. You can buy the epic gear crate and sometimes you will actually receive legendary equipment. I would not splurge and buy a legendary crate at your level because you will quickly outgrow that equipment so not such a good investment. At your player level I'd probably buy the radio's. 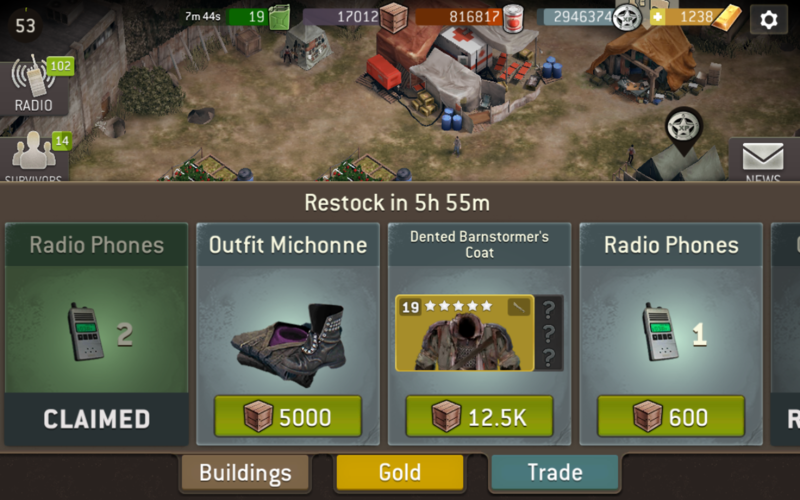 Better survivors are of more value than the rest of the stuff in the store. Would definitely not buy any legendary gear/crates (they will soon be useless). Probably an Epic once in a while. I would also buy the gold crates. Hey @SCBMA and @GreySeer - thanks for the responses. So both of you argue that legendary gear isn't worth buying because I'll outgrow it. At what point is it worth buying legendary equipment then? I only buy hero tokens and phones from the shop. It depends how fast you are upgrading you survivors. If you are at a comfortable spot then buy the legendary gear but if you are quickly advancing then wait. Again, sometimes you can get legendary gear in the epic crates so you spend less TG for the same thing. It's hard to say, because when the game started you could'nt even get it. The tokens didn't exist and your survivors were capped at a certain level. I think my survivors were around level 14 (they are 16 now) when this all changed and we got the TG store as it is today. Personally I only get legendary gear from the shop when I level up and need better gear. Because you don't know the traits you could easily waste 12.5k TG. Some might argue that even at my level it's still wasteful to get the legendary gear, but because I level quite slow I easily get the value out of it. Thanks again for the feedback guys. I understand your point about buying legendary items, so is 20 the max level for gear? I think I might start going for the phones as waiting to accumulate 15 for the 3* call can take a while sometimes! The maximum base level of gear is level 20, you can upgrade it up to level 23. Do you play the weekly challenge missions? Those crates seem to have more phone rewards than the scavenger missions. And if you join a guild you get phone rewards too! @SCBMA Yes - I do the challenge missions with my guild. I didn't realise the phone drops were better for those, but I know about the phone rewards for milestones. Even then, 15 is quite a lot to accumulate so I might start buying them from the store when they're on there. At your level I would just get class and hero tokens and radios. I would wait on equipment so you don't outgrow it and spend a lot of experience on equipment you will eventually salvage. Once the equipment level is 18-19 then you can debate on getting some then or waiting till it's 20. @Jcsking1 Phones, Phones, Phones! And the occasional 8 Gas to keep rolling with the missions.I've only done Hero or Class tokens if I was really close to the next upgrade. When you get higher, Epic and Legendary crates can sometimes help. Good luck! Has anyone purchased the Dented Barnstormer's coat that showed up yesterday that can share it's traits? The traits are random for every purchase. So it's a gamble. I wouldnt buy epic crate even though im max survivor lvl now. Not only do i have tl gamble whether it going to be epic or legendary, there also based lvl discrepancy from 18-20. Same go for legendary crate in regard to base lvl.